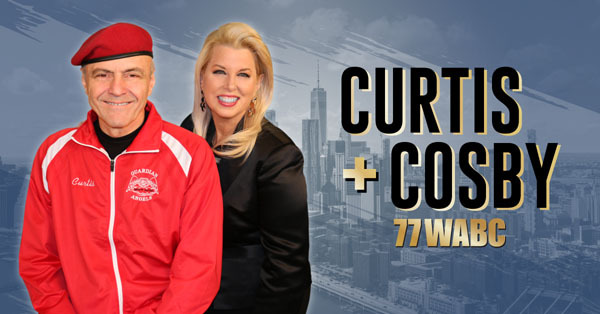 77 WABC Radio announces the powerhouse pairing of quintessential New York host Curtis Sliwa and acclaimed Emmy-winning journalist Rita Cosby for the dynamic new talk show “Curtis + Cosby”, debuting Tuesday, February 6, from 12-3pm on 77 WABC Radio in New York City. The “Curtis + Cosby” show brings together two renowned New York natives and experienced broadcasters for the first time: Curtis Sliwa, the iconic founder of the Guardian Angels and Rita Cosby, the award-winning TV/Radio host and best-selling author. Sliwa enters his fourth year hosting Middays on 77 WABC. Cosby continues as 77 WABC Political Editor, expanding upon her role since 2014 hosting the Gracie Award-winning “Election Central” and “The Rita Cosby Show”. A leader in the radio broadcasting industry, Cumulus Media (PINK: CMLSQ) combines high-quality local programming with iconic, nationally syndicated media, sports and entertainment brands to deliver premium content choices to the 245 million people reached each week through its 446 owned-and-operated stations broadcasting in 90 US media markets (including eight of the top 10), approximately 8,000 broadcast radio stations affiliated with its Westwood One network and numerous digital channels. Together, the Cumulus/Westwood One platforms make Cumulus Media one of the few media companies that can provide advertisers with national reach and local impact. Cumulus/Westwood One is the exclusive radio broadcast partner to some of the largest brands in sports, entertainment, news, and talk, including the NFL, the NCAA, the Masters, the Olympics, the GRAMMYs, the Academy of Country Music Awards, the American Music Awards, the Billboard Music Awards, Westwood One News, and more. Additionally, it is the nation’s leading provider of country music and lifestyle content through its NASH brand, which serves country fans nationwide through radio programming, exclusive digital content, and live events. For more information, visit www.cumulus.com.